Journalist and TV reporter Dan Groves normally works on environmental issues, but with Christmas fast approaching and no-one to cover a crime story, Dan is thrown in at the deep end. However, his tactics of getting a prostitute to talk about a recent spate of attacks on them see him being reprimanded. He is taken off his normal duties in environment and given the job as Crime Reporter instead – I’m not sure whether this was supposed to be a demotion or not – Not long after being given the job a report comes in of a man being shot and killed. Dan races to the scene, but it seems he is too late, as other journalists were given a tip-off well before Dan, and the police have already given them a statement, leaving Dan without any real information and playing catch-up. Needing to get ahead in the game he persuades DCI Adam Breen to let him shadow him on the case. 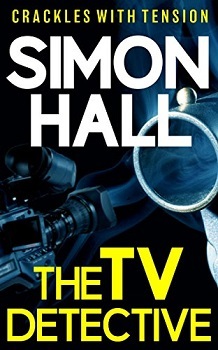 The TV Detective is the first book in a huge series and has just been re-released by Fahrenheit Press. I’ll be honest and say I’ve never heard of the series until I was asked if I would like to read and review the first book. The author, Simon Hall, has spent many years as a journalist, so he knows his stuff when it comes to how the press works and the ins and outs of everyday life in the field. With this in mind, you can certainly see he has used his experience to make the book as realistic as possible. Dan Groves is a normal, down-to-earth guy working in a profession he loves, although environmental issues are what he really loves, he makes sure that he gives his new career in crime 100%, hence the offer to shadow DCI Breen. The pairing of the two, journalist and detective is a brilliant combination as the two bounced off one another. Their relationship is mainly what makes the book so interesting, that and the case of a man being killed that no-one likes and no-one seems to be bothered about. This is a great start to the series. The read actually felt effortless and smooth. It is not a thriller, more of a police procedure, crime reporting book, so there aren’t any edge of your seat moments, but the book had a plot entertaining enough to hold my attention for the duration. Hopefully, I’ll get to read more in the series in the future. Simon Hall is an author and journalist. He has been a broadcaster for twenty five years, mostly as a BBC Television and Radio News Correspondent, covering some of the biggest stories Britain has seen. Simon has also contributed articles and short stories to a range of newspapers and magazines, written plays, and even a pantomime. His books – The TV detective series – are about a television reporter who covers crimes and gets so involved in the cases he helps the police to solve them. Seven have been published. Alongside his novels and stories, Simon is a tutor in media skills and creative writing, teaching at popular Writers’ Summer Schools such as Swanwick and Winchester, on cruise ships and overseas. Great review! Love the cover too! I think I’d enjoy this series. Adding to my TBR. Great review! This sounds like a very engaging read. Great review. I have heard good things about this one. Great review! I never heard of this series either, but it looks to be a pretty good one. I may have to start it soon. Great review, this is actually the first time I heard about this book but it really does looks and sounds absolutely fantastic and great. I might need to check this one out one day, thank you so much for sharing your awesome post and for putting this book on my radar.